Thousands of new contents' links, listings and entries will be posted on this page very soon. Various states of metamorphosis of the mind-body of a deceased in the after-life. Experiences dead people encounter in the next dimension. The mental or astral projection of the dead human body leaving Earth. Lost Souls”, “Trapped Souls”, and Dead People who live in a sphere between Earth and the afterlife. The first stage of the afterlife during the 40 day period following death. Sensations dead people feel, when they enter the first stage, and/or the zone of the after-life. The projection of the images of the bodies of people who have passed away. Map of the Afterlife “Anunnaki’s Marda-kharta”. Physical manifestation of a dead person, before entering another dimension. Communication with our Dead Pets “Gensi-uzuru”. When your departed loved pet returns to see you. The origin, true and secret name of God “Yahweh”, “Jah”, “Yah”. Who is God? Do Anunnaki believe in God? Anunnaki’s god is not the same “God” we worship on Earth. The Gnostics: Earth was not created by the God of the Church, but rather by an evil demi-god. The early names of the Hebrew God were of an extraterrestrial origin. The Tay Al Ard, self-teleportation and concept of the Alkiramat “Keramat”. On Foreseeing the Future and Rewinding Time. Fact or Myth: Why mediums, psychics and channelers can’t predict the future? The future is not defined and/or measured by time and space. How do the Anunnaki Ulema transport you in the future and rewind time? A projected future occurring in the present. The Human Brain: “The Supersymetric Mind”. Study of the influence of the Anunnaki’s programming of our brain and fate. Many of you came to me and asked me why some people are luckier than others? A brief note on supersymetry. What is a “Supersymetric Mind”? All humans have more than one brain. The Duplicate Image of Ourselves or Reproduction of our Being in other Dimensions “Ishra”. The Ability of Observing Spirits and “Entities Fluctuation” (Idartari). Pets and children ability to see non-physical entities. Folding-Unfolding the Earth “Hiraaba-safri” and time-space travel. Mental Projection of the Self : The KA. The Conduit “Secret Supernatural Cell: in our brain. Interpretation of Messages Sent to the Conduit “Haridu”, “Haridu-ilmu”. The Anunnaki Ulema Supernatural and Mind Power Techniques: Entering a Parallel Dimension. ARAWADI: The supernatural power or faculty that allows initiated ones to halt or send away problems and mishaps to another time and another place. What is Arawadi? And how does it work? It is possible to enter that parallel dimension and leave there all your troubles? YES! Techniques from the Secret Doctrine of Anunnaki-Ulema. The Double, the Astral Body, the State of Oneness and the Enlightenment. On the relation between the physical body and the non-physical body at the time we were born. What is the “Double of us”? Or simply “Our Double”, or “Copy of Ourselves”? The body you had before you were born. On the Double interaction with babies and children: Does my double interact with me while I am still a baby? Can we communicate with our “Astral Body”? YES! Learning from our Double and acquiring supernatural faculties: What do we get from zooming into our Double? Dematerializing and walking through a wall. On contacting the dead through your Double. Can we contact our departed parents through our double? You Astral Body/Double Entry into Another Dimension (Kabari Idikhal). On parallel dimensions, multiple dimensions and stargates to other worlds. Is the Fourth Dimension the world beyond? “Chabkaradi” is the name of the Fourth sphere on the cosmic net. So what is Chabkaraki? Abraa–Abru: Entering the 4th Dimension and Returning From the World Beyond. First and foremost: Is it possible to visit the world beyond? YES! The Ulema can enter the after-life dimension, and other parallel dimensions, and return to earth through a multitude of ways and means. What would happen to us when we return to Earth after exiting the 4th dimension? Yes! We can split time in two. Images and people we see in another dimension. The Fifth Dimension is a wonderful place, where all of you reach the state of quasi-perfection. On life after death and the collective mind’s transmigration phenomenon. Stargates: Entrance to other worlds. Metaphysical, religious and mythological stargates. Did Aleister Crowley open a vortex-gate as he has claimed? IT IS TIME TO LAUGH: ANCIENT ALIENS TV SHOW FARCE !! Thousands of new listings and entries will be posted on this page very soon. UFOs & COVER-UPS: OUR FORMER PRESIDENTS SAW A UFO. PRESIDENT HARRY TRUMAN AND THE GERMAN UFOS' COVER-UP. WAS SECRETARY FORRESTAL THE FIRST UFOS' COVER-UP VICTIM? WAS HE KILLED? THE NEW NAZI WORLD ORDER'S UFOS THREAT. WHY THE UNITED STATES IS STILL REFUSING TO ADMIT THE EXISTENCE OF UFOS? GERMAN UFOS ATTACK THE SOVIET UNION. ATTACKING EARTH: EXPLAINING THE DIFFERENCE BETWEEN GERMAN UFOS ATTACKING EARTH AND ALIENS ATTACKING OUR PLANET. THE ALIEN GRAYS AND GENERAL EISENHOWER. THE NEW UFOs WONDER WEAPONS OF THE NEW NAZI WORLD ORDER. HITLER AND THE UNITED STATES MEETING AFTER WORLD WAR TWO. HOW HITLER ESCAPED ABOARD A BELL-UFO !! UFOS: WHERE DO THEY COME FROM? THE REVENANT, DIRECTED BY D. KERRY PRIOR. DON'T MISS THE NOVEMBER ISSUE OF ART, UFOs & SUPERNATURAL MAGAZINE, IN FULL COLORS !! On the cover, the Great Patti Negri, First Lady of the supernatural and occult, and the sensational Sunhee and Chinhee Park. Best Psychics in America...Best Psychics in the World...America's Best and most Caring Psychics...Psychics who Really care about You! AVAILABLE NOW !!! 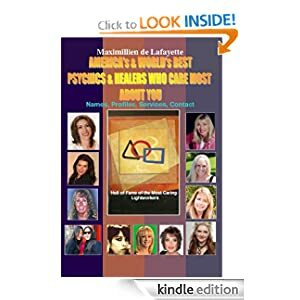 New Book: AMERICA's & WORLD's BEST PSYCHICS & HEALERS WHO CARE MOST ABOUT YOU: Names, Profiles, Services, Contact. THIS IS A BOOK OF THE ABSOLUTE TRUTH, MADE BY THE PEOPLE FOR THE PEOPLE !! GET RESULTS FROM PSYCHICS, MEDIUMS & HEALERS RECOMMENDED IN THIS BOOK!! 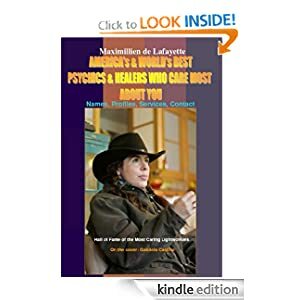 15-Maximillien de Lafayette's favorite mediums, psychics, healers and lightworkers, and WHY? 16-Profile of their personality, persona, character and what makes them so special!! Don’t spend a nickel on any psychic, medium or a healer, before you read this book. 10-And accounts and comments by psychics, mediums and healers themselves. It is not enough to be an effective lightworker. It takes more than proficiency to be a good psychic, medium and a healer. 1-How about their integrity, honesty, and demeanor? 2-Are they warm and friendly or a snake in the grass? 3-Do you know about the techniques they use to rip off clients? 4-Is the goodness of their soul important to you? 5-Are they friendly, and warm? 6-Do they REALLY care about you? 8-How to find those who care about you and how to contact them? 9-Learn more about their character, level of spirituality, personality, services, rates, biographies, profiles. 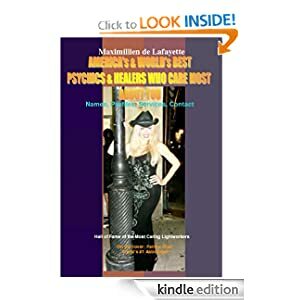 Based upon his 50 years of experience in the field, communicating with thousands of genuine and fake psychics, mediums and healers from around the world, writing more than 250 books on the subject, and reviewing/analyzing undeniable facts about psychics, mediums and healers, Maximillien de Lafayette (Author of 1,200 books) wrote this most indispensable book and guide. He will refer you ONLY to psychics, mediums and healers who honestly care about you. Avoid lots of troubles and wasting your money, hopes and time on those who don’t give a damn about you and your concerns. The book lists and describes in detail, psychics, mediums and healers with human warmth, brains and heart, who will help you, guide you and deliver the kind of help, aid and information you are seeking. Don’t waste you time looking for readers in tabloids and on Internet fake lists; the good, the best, the most effective, and the loving ones are HERE in the book. Published by UFOs & Supernatural Magazine. Who are fully trusted because they were effective, very friendly and loving. Published by Times Square Press, and WJNA, New York. Handbook of Curriculum, Lessons, Training, Supernatural Techniques and Powers. • How to find the healthiest spots and luckiest areas on Earth, and take advantage of it! Learn how to befriend spirits. This book is unique and extremely useful for many reasons. Mainly because it provides both the beginner and experienced practitioner with the necessary guidance, training, methods and techniques to communicate with various kinds and categories of entities, to foresee future events, and above all how to effectively develop extraordinary supernatural powers.